In the middle of my recent spate of Icelandic books, I read Sarah Moss’ Names for the Sea, a non-fiction book about a year an English woman spent in Iceland. While entertaining, it was very much an outsider’s view of the country and left me wishing that there had been a little more insight into Icelandic life. The Promise of Iceland was written by Australian university lecturer Kári Gíslason, possibly to work through some of the events of his earlier life. Gíslason was born in Iceland to an Anglo-Australian mother, the result of a lengthy affair she had with a married Icelandic man. Despite the welcoming attitude of most Icelanders to any child, Gíslason’s mother decided to respect the wishes of the reticent father, keeping his identity a secret for the best part of three decades. It was a conversation that was repeated almost word for word when she spoke to her landlord, Brynjólfur, about whether she would be able to stay in her apartment in Sólvallagata. There are obvious comparisons with Names for the Sea, and the same themes pop up, whether it’s the attitude towards children, the obsession with coffee and knitting, or Reykjavik’s small-town atmosphere (at one point the writer regularly bumps into Vigdís Finnbogadóttir in a shop – a woman who was the country’s President at the time!). 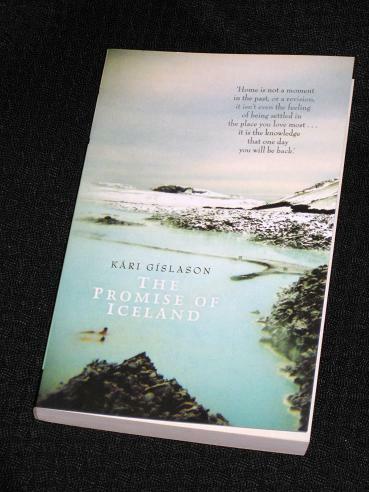 In other ways though, Gíslason’s background means that The Promise of Iceland is a very different book. Moss was a tourist; Gíslason was a (semi-) native. Moss visited the distant Westfjord islands; Gísalason lived and worked there. Where Moss was frustratingly introspective at times, Gíslason opens the country up for us. I'd heard of 'Names for the Sea' and was planning to read it (as an interesting example of culture clash, perhaps? ), but this seems an even more interesting book. I always find issues of cultural identity and search for family fascinating. Thank you for pointing out this book to me! This sounds fascinating! I am a bit of an Iceland fan and this book is going my wishlist. Indeed, your remark at the end about the patronymic – all the way through your review I was thinking: the first problem is when registering the birth, because there are no last names in Iceland – babies get their father's first name plus -son or -dottir. So sad when this is denied a young child. I'm very curious about this book! Marina – 'Names for the Sea' is interesting, and it's very good on recent issues in Iceland, but the reality is that there's not as much there as I'd like. It's basically 'My Year in Reykjavik'. This one is a much more fascinating story, with many more insights into Icelandic family life. Judith – It's a great book, and you're right about the birth certificate (that's actually an important part of the story…). This sounds like my kind of book, and how amazing that it gets published all the way over here in Oz! Lisa – It's an excellent book. He's actually a lecturer at UQ, so perhaps it's not that far a stretch 😉 I think it was shortlisted for the Queensland people's Choice(?) Award last month. Given your current love for all things Icelandic, can I slightly tenuously ask if you've read a Faroese book, The Old Man And His Sons by Heoin Bru? You might like it.